Despite oft being surrounded by vegetarians, I’m very much a carnivore – and one of the obsessions we’ve been developing at work is a real penchant for dried meat products. It started with Beef Jerky, and now we’re on to Biltong. A process that originates from Europe but was made widespread in South Africa when the new colonisers needed to be able to preserve food whilst they developed herds for a sustainable food source. My fledgling Biltong in it's dryer awaiting nature to take its' course! Anyway, I digress. It’s yummy – so naturally we started looking at how one would go about making it (as you do), and it’s surprisingly easy – the only tricky we have is our climate is a little strange. 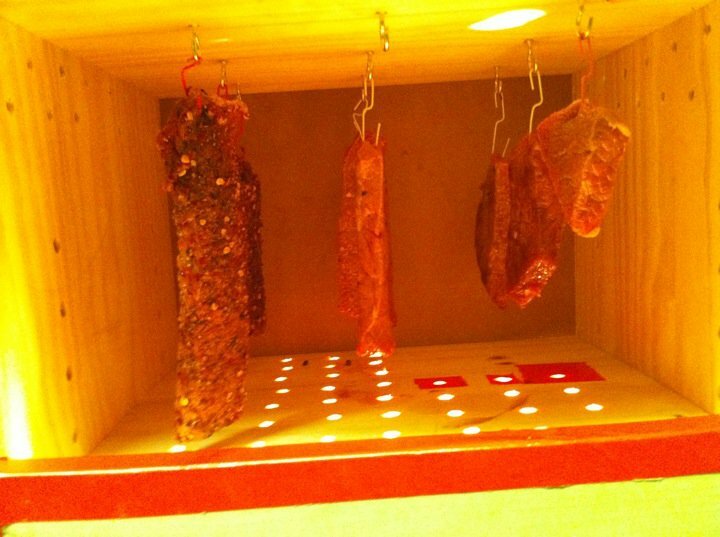 Drying meat doesn’t necessarily need heat, but it does need airflow and also a dry (ie, not humid) atmosphere – so for something effective in our climate I used some instructions I found on the internet to make a very basic ‘biltong box’ in which to hang my meat (wahey!). Whilst out and about picking up suitable parts for my new toy I also picked up a topside steak from Morrisons to be my first experiment. My first job was to assemble the loosely planned design I had in my head from a shelving unit that was on sale in B&Q, some bits of wood I had from some doomed project or other, and some electrical bits to add a light bulb to the lower compartment. It went surprisingly well, so I also had time to prepare the meat this evening and try a number of different marinades – I have eight pieces of meat now hanging in the garage, three with a kind of spiced/salted herby ‘rub’ on them, two with a sweet chilli marinade, two with Reggae Reggae Sauce covering them and finally one small piece with no marinade (beyond the salting and vinegar process recommended in the instructions) just to see what it tastes like unadorned. Obviously being the first attempt it’s tricky to know when it will be ‘done’ so I think I’ll leave it towards the longer side of the 3-5 days it should take to dry. It seems weird you can just make raw meat edible by leaving it to dry, but then I suppose technically it’s edible raw anyway. With a bit of luck it will be suitably dry by Thursday evening so that I can take some in to work on Friday to test out on the my fellow Biltong fans at work! For those of you who may have had their interest piqued but don’t want to go so far as to making your own Biltong over a period of days – you can apparently use an electric fan-assisted oven set to 40-70 °C (100-160 °F), with the door open a fraction to let out moist air – this can apparently dry the meat in approximately 4 hours. Failing that, I found (via Jonathan – thanks Jonathan! – this awesome website which sells a variety of Biltong made from different meats, I might just have to place an order irrespective of how mine turns out! Today I also found a stash of unidentified homebrew in a kitchen cupboard, so a meat and ‘wine and mead we’re not sure specifically what it is made of, or when it was made’ evening might be on the cards! Amongst that lot was also an Elderflower wine kit so I might get around to making that too, whilst I’m in some kind of foodcraft kind of a mood. Alcohol and meat – awesome.